The Cage is a brilliant yet harrowing account of Sri Lanka's fall into darkness. Since independence in 1948, Sri Lanka has been marred by a toxic mix of religion, nationalism and xenophobia. Post-colonial governments ruled with an iron fist, and democracy crumbled. Extremist Buddhist monks preached bloodshed. Pogroms and death squads killed tens of thousands in the 1970s and 1980s. The Cage unravels the compelling history that led to the horrific events of 2009, when government forces surrounded the brutal Tamil Tiger guerrillas and hundreds of thousands of civilians on a tiny sand spit. Were tens of thousands of innocent people killed in the first months of that year? Was the government's destruction of the Tamil Tigers justified? Were war crimes committed in the process? And why is it that unlike recent events in Libya, Sri Lanka escaped detection and the censure of the watching world? The Cage analyses the serious questions thrown up by Sri Lanka's "war on terror" for the liberal international order. It examines how it was that on the strategically vital island, the three Indian Ocean super powers - the US, China, and India - jostled for supremacy, while the 21st century's first major war crime unfolded. The death of a democracy, the suppression of a people, the fight for Sri Lanka. Few Americans know much about Sri Lanka. I was one of them until I read this book. I decided it was time to learn more after I was named to the president’s leadership council of a prominent Asian-focused non-governmental development foundation and then was invited to visit and assess the country operations in Sri Lanka, including the northern Tamil city of Jaffna. “The Cage” is roughly broken into two parts. The first third is a crisp primer on the island’s history with special focus on the roots of the Buddhist Sinhalese versus Hindu Tamil conflict that has shaped the trajectory of internal affairs for roughly the past century. The final two thirds is a blistering indictment of the Rajapaksa regime, especially the government’s conduct during the final siege that annihilated the Tamil Tigers and its senior command structure, but also left possibly tens of thousands of innocent Tamil citizens dead or maimed. I loved the first third. It was exactly what I was looking for – an accessible and generally balanced narrative of Sri Lanka from its most early history and its colonial experience under the Portuguese, Dutch and then the British to its fitful steps as an independent nation struggling with racial, caste and economic cleavages, which resulted in one of the most vicious and horrific internecine conflicts of the modern era. Weiss consciously compares recent Sri Lankan history (i.e. the past century) to that of Israel, with the Sinhalese and Tamils in the role of the Jews and Palestinians, respectively. 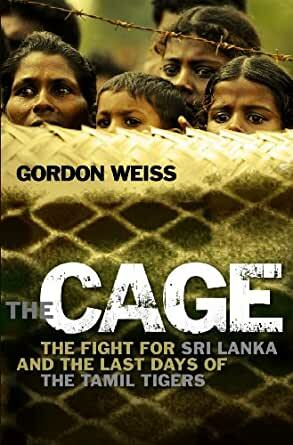 It’s an analogy that is at once helpful and harmful, as Weiss (despite his Jewish heritage) clearly sees the Sinhalese/Jewish governments as the villains of the story, although he is quick to note the humanity and generosity of the Sinhalese people, including front line soldiers. The roots of the conflict, as described by the author, are truly fascinating. For centuries, Buddhism dominated South and Central Asia. The famous statues of Buddha in central Afghanistan at Bamiyan (destroyed by the Taliban) are testament to the religion’s ancient sweep and sway. As Hinduism and then Islam pushed Buddhism out of the subcontinent, the island of Sri Lanka remained a bastion of the religion until the nineteenth century. The British colonial government promoted the study of English, the worship of Christ, and the growing of tea, an activity for which they had to import tens of thousands of South Indian Hindu Tamils to work the expansive plantations of Thomas Lipton. The upshot was that Buddhism was on its last legs when a swashbuckling American arrived in Colombo in 1880, Colonel Henry Steel Olcott. A Civil War veteran and spiritualist, Olcott came to Sri Lanka (then called Ceylon) to re-awaken Buddhism, which he believed was the true universal religion of mankind, far superior to the Christianity of his birth and native culture. At roughly the same time that Olcott arrived on the island an ancient Sinhalese text, the Mahavamsa, was “re-discovered” by the British and then translated into Sinhalese. Weiss calls the Mahavamsa a “mytho-historical document” that serves as the foundation for Sinhalese Buddhist nationalism, much as the Old Testament underpins the Jewish historical narrative in Israel. Olcott attracted a local protégé, Anagarika Dharmapala, who eventually twisted his message of peace and Buddhism as a universal religion into one of virulent Sinhalese nationalism and anti-colonialism. By the time the British retreated from their colonial empire after World War II the seeds had already been sown for future conflict. The Sinhalese Buddhists accounted for perhaps 75% of the island’s population, but they were under represented in key civil service positions, as well as professional and academic posts. The minority Hindu Tamils (perhaps 20%) had benefited from extensive English language training under the British system and had thus advanced far in the traditional structures of colonial power. Once independence arrived, the majority Sinhalese worked to redress the perceived imbalance in power and reassert their position as the true and “chosen” people of Sri Lanka, an image Weiss claims is analogous to the Jews in Israel. This cultural re-awakening and majority power in a new democracy culminated in the “Sinhala Only Act” of 1956, in which Sinhalese was made the only language for government and the academia. Suddenly, native Sri Lankan Tamils, most of whom only spoke Tamil and English, were treated like foreigners in their own land by their own government. By 1983, after a dozen Sinhalese soldiers were killed in the Tamil north, the country erupted in anti-Tamil riots that left thousands dead and served as the impetus for the Tiger's quarter century violent quest for an independent homeland. The second two thirds of the book are pointed and repetitive, with a clear undercurrent of personal malice against the current Sri Lankan government. The author’s basic argument is basic and credible: “It is not that the SLA (Sri Lankan Army) should have ceded its right to conquer its Tamil Tiger enemy, and to extinguish the practice of terrorism from its sovereign soil, but at the point at which it arrived on the shores of the lagoon [The Cage], with soldiers and armaments outnumbering its enemy by a factor of at least thirty to one, did those in command correctly weigh the advantages of an SLA assault versus the cost of civilian lives?” And, in particular, should not the SLA have refrained from the use of heavy artillery in areas where large concentrations of Tamil civilian refugees were known to be? Weiss makes it evident that it was the strategy of Tiger supreme leader, Velupillai Prabakharan, to deliberately use his own people as a shield and, hopefully, to have the SLA kill as many women and children as possible so as to stoke a sufficient international response to save his incredibly violent, but crumbling secessionist movement. Tiger artillery fired on SLA positions from areas crowded with refugees and then quickly evacuated the area, knowing full well that SLA radar-powered counter batteries would soon drop rounds in the area in response. The Tigers also deliberately used hospitals as command posts and would gun down any Tamil civilians who attempted to flee in the direction of the SLA lines seeking refuge. The image “The Cage” presents of Prabakharan and the Tigers is truly reprehensible, even though the author often refers to them in the most glowing terms: “courageous cadres” of Tigers…possessing ”unquestionable valor”…and demonstrating ”dogged fighting skills.” Meanwhile, the Rajapaksa government is buried under a withering storm of abuse. For instance, “It is a government that is so cocksure of the efficacy of its thuggish rule that it seems blind.” In many ways, Weiss crafts the second two thirds of the book around the theme of Rajapaksa (especially defense minister Gotabaya Rajapaksa) versus Prabakharan. Two men of immense ambition and absolute ruthlessness, the final conflict of The Cage, as told by Weiss, almost feels like a modern reenactment of the mythical clash and victory of the Sinhalese king Duttugemenu over the Tamil king Elara, a "Manichean battle" familiar to all Sri Lankans and core to the identity of Buddhist nationalists who proclaim Sri Lanka for the Sinhalese. I have no doubt that the Rajapaksas are tough, uncompromising characters with blood on their hands. But they certainly seem to me no worse than Prabakharan, a leader who killed thousands of his own people and led an organization that employed suicide bombings as a core tactic of an elite cadre of fighters, the Black Tigers, which launched 137 missions involving 273 bombers, including 47 women, over 27 years.. The crux of Weiss’s argument is that the Rajapaksa government knew that hundreds of Tamil civilians were being killed as the noose tightened around the Tigers in early 2009. Alarming reports from UN and Red Cross officials in the kill zone were suppressed or denied. With the Tigers finally surrounded and adhering (foolishly) to a last stand approach rather than melting back into the population to fight another day, the Rajapaksa brothers – president and minister of defense – were committed to extinguishing the insurgency once and for all. The government loudly and proudly proclaimed a zero tolerance for civilian deaths, but Weiss says it was all a fatuous show. The extent of civilian casualties was known at the highest levels of the army and elected leadership, but was viewed as an acceptable price to pay for final victory, trusting that their authoritarian control of the domestic judiciary and media along with the international backing of the Chinese to provide interference at the UN would be enough to get them through the storm. Indeed, the role of the Chinese as recent benefactors to the Sri Lankan government is interesting and convincing. Winning over the Rajapaksa government to Beijing accomplished several objectives at once: an additional “pearl” in the Chinese string of deep water ports along the strategic lines of communication in the Indian ocean, while establishing a strong presence within traditional rival India’s clear area of influence, as Sri Lanka is separated from mainland India by less than fifty miles across the Palk Strait. The most disappointing aspect of this book for me was the analysis of the Tamil Tiger’s ultimate defeat. Weiss writes that “[Prabakharan’s] rise and eventual fall were as spectacular and surprising as each other.” While he does a fair job assessing his improbable rise to leadership of a highly effective and well financed terrorist/freedom-fighting organization, he says little of value about the movement’s crushing liquidation. It seems to me that Weiss doesn’t understand much about the nature of insurgency. He suggests that the SLA defeated the Tigers because they had an overwhelming advantage in firepower. But insurgencies are rarely defeated by technology or weaponry. Did not the United States possess a staggering advantage in front line troops and firepower in Vietnam? Or the Soviets in Afghanistan? After reading “The Cage”, it feels like the SLA won primarily because Prabakharan and the Tigers lost the support of their own people. Indeed, that’s the only way popular movements ever “lose” in an insurgency. A genuine, popular-base people’s war simply cannot be defeated by force of arms. It’s an impossibility. Forced conscription, often of children as young as ten, the deliberate use of civilians as shields, and the readiness to gun down anyone willing to seek shelter with government forces, turned the Tigers into a cancer on the Tamil people, a curse the vast majority were willing to see annihilated. Unfortunately, Weiss doesn’t review the final days of Tigers from this perspective and the overall narrative suffers because of it. In the end, I learned a lot from “The Cage” and I’m certainly glad I read it. I can’t say that I agree with all of the author’s conclusions, nor that I he answered the basic questions I had about the defeat of the Tigers, but overall “The Cage” is a credible and accessible introduction to the subject, although a bit stilted and incomplete. Mr. Weiss appears to have been successful in bringing together history, recent events and his recollection of what has happened during the civil war. I am neither a Tamilian nor in anyway associated to Sri Lanka, I bought this book to take a dive into the real background and I must say, the book does not disappoint relative to that desire. If anyone has a literary itch to know history related to Sri Lanka, this book would not be a bad one to read. The only issue that I have with this book - due to lack of adequate knowledge of the English on my part - is that, I had to constantly lean on a dictionary. Mr. Weiss used rather uncommon (and powerful) words, however, I did not mind traversing back-and-forth between the book and an online dictionary, although, it was distracting at times. This was a very thorough if somewhat confusing book. I had to check I wasn't losing my place because of the same idea being reworded a few sentences apart so often. 3.0 out of 5 starsAn interesting but difficult journey through Sri Lanka's history. Although a difficult read, very interesting book about Sri Lanka and their internal strife. Gordon Weiss (@gordonkweiss) organizes his book in a very interesting way. He starts off with a bit of a blitzkrieg covering Ceylonese history from creation myth onward to about the 30 or so years past independence in 1948. For those of us not well versed in these events, this section is particularly useful & summary enough to be a breezy yet informative read establishing socio-mytho-economical context of the division of the two sects separated by the Eelam wars, the rise of oligarchical governments, the vestiges of fair governance, independent judiciaries, & a free press disappearing fast. It is in covering the final Eelam war that led to the decimation of the LTTE that Weiss vacillates between the main narrative & many interesting auxiliary ones. From talking about the siege, he quickly drifts off into civilian killings & then does a few stories on both the independence of the judiciary, & the absolute harassment of the press & then returns to the kill of Prabhakaran ending his story with a nice long chapter speculating on what such a thing means for the future of the world in general, ticking off just about every country in the process for either overtly or tacitly supporting a killer regime. There are a few of things that, I think, could have been better about this book. First, the constant to & fro between various themes & overlapping chronologies is rather confusing while you're at it. So while all the content is definitely necessary in building a coherent view of Sri Lanka's politics, the organizing principles are slightly off. Second, Weiss fails to tell personal stories making all of this really come alive. I reckon a large part of this owes itself to the secrecy that has been the bedrock of these developments in Ceylon. Weiss's writing modularizes this civil war & the larger post-independence history of Sri Lanka. So while in all his stories the chief characters meander in & out, it is ultimately about none of them - it is the record & significance that Weiss is after; not personalities & drama. Thirdly, the rise of the LTTE, covered in the summary section above, was a little less on detail - this book is about the final war, the build up is all summarized.